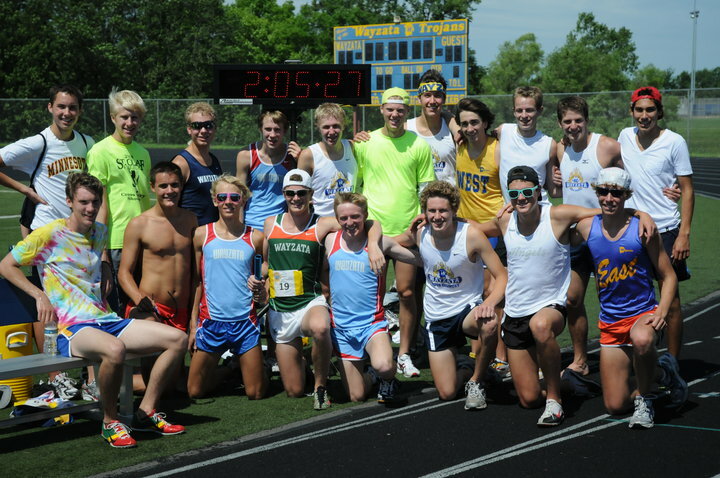 This past June, the Wayzata High School Track team organized a fundraiser in support of the Mayo Clinic, and in particular to raise money for their work in cancer research. There are two fathers of runners on the team who have battled cancer and have been treated at the Mayo Clinic and the team wanted to support them and people in similar situations to them by conducting a fundraiser. The choice of fundraiser: a potentially world-record-breaking relay-marathon. The world record for one man to run a marathon is 2:03:59, a 4:43 minute per mile average for 26.2 miles. The Wayzata team attempted to break this daunting record in relay-fashion by running 26 one-mile legs and a .2 mile leg together at the end around a track. The team dedicated the race to the two fathers of runners on the team who have battled cancer and the team raised money from members of the community to support them. The runners ended up coming a minute and a half short of the record, but all was not lost as the community was very supportive of the cause and was very willing to donate. The Wayzata High School Track team was able to raise $7,000 for cancer research from this event and they hope that this can help make great strides in the battle against cancer.